The Last Witch Hunter is more than just a hunter who protects humans from those who use magic in evil ways, he is one to be feared and as an immortal, he's learned all the tricks to come out on top while facing any opponent. Vin Diesel brings Kaulder, the Last Witch Hunter to life and just like all Vin Diesel movies, he has the same acting persona. I'm a Vin fan,and enjoyed him and this character. His sidekick is a previous Hobbit from the Shire (Elijah Wood) who works for the church as the 37th Dolan and is equal parts useless and a great help. His character does a surprise turn toward the end that might shock you. Both Diesel and Woods are in a secret organization that governs those who use magic strictly to follow the laws. If you don't follow them they send their weapon, the Witch Hunter, to track you down and if it's a major crime they are imprisoned for a long period of time. One witch who befriends the witch hunter is Chloe (Rose Leslie), and without her their main foe would be too hard for Kaulder. Another iconic actor who makes an appearance is Michael Caine as the 36th Dolan, You don't see him too much but when he's on screen he's always a treat and reminds me of the times he played Alfred in Batman with a similar role here. I liked The Last Witch Hunter but I can see where some might not enjoy it — some scenes were cheesy and Vin's acting doesn't bring anything new. The storyline was pretty fun, especially with magic in the air. 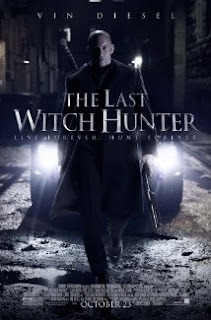 The Last Witch Hunter faces an evil he has faced before and without the help of his current and new comrades it would be all but impossible to triumph. Does he save the world entirely or is there something even more evil out there?